Is formalised project planning and management useful in social science research? 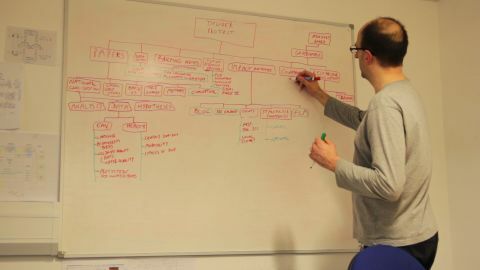 Without going into too much tedious detail, we started off trying to map out the key components of the project, nested in a hierarchical ‘Work Breakdown Structure’ or WBS (see poorly posed photo). Our topline outcome is ‘deliver project’, which requires subordinate outcomes such as ‘papers’, ‘impact monitoring’ and so on, with each of these requiring subordinate tasks to be achieved. At the finest resolution are ‘take-away tasks’, which can be assigned to an individual or group, and allocated an estimated duration. This ‘map’ of the project is still a work in progress and has taken some thinking about in order to break down the whole project into bite sized chunks. Then comes the fun bit, with all the ‘take-away tasks’ being allocated to a post-it, and a network diagram created indicating which post-its have to be completed before others and how they all flow along to produce the desired outputs. Once this is done, with durations and ‘resources’ (mostly person-time in our case) allocated to each post-it, in theory a Gantt chart can be produced, potentially using software like MS Project. There are various details I’ve missed and refinements to the process, but that seems to be the crux of it. It feels like this is a useful thing to do at the moment, primarily for the process of working through all the project elements and how they fit together as a team. It’ll be interesting to see how useful the outputs – network diagram etc. – are as we proceed. It definitely makes sense that it’s much easier to keep a handle on how a project is progressing if the tasks and outputs are relatively small, identifiable and easily measurable. I have been convinced that if a task on a Gantt chart is 6 months long, it’s pretty much impossible to tell whether it’s going to be achieved until very late in the day. Having said that, it’s definitely challenging to boil down the whole project into clearly defined take-away tasks. And it’s even more challenging to specify durations – lots of tasks, such as analysing data with GIS, can be highly unpredictable in terms of how long they’re going to take. The planning process allows for this by permitting uncertainty, three point estimates and so on, but it seems like it might make for a pretty gelatinous plan. Has anyone had good experiences applying formal project planning/management to social science research projects? How can we get around the vagaries of task identification and duration estimation? Glad to see someone talking about this (albeit 5 years ago). I feel like project management for research and in particular social science research is not talked about at all. I’ve done a couple of schedules for gathering socioeconomic and demographic data in rural Haiti using Microsoft Project. It is definitely hard to decide the logic and relationship between task to create the timeline. Some of the relationships end up feeling pretty arbitrary with no actual causal link like finish to start between them. Task 2 doesn’t have to come after task 1 for any other reason other than I want to… Which doesn’t seem right, but I don’t really see another option. And then in terms of estimating duration like you saying. Any project schedule will vary from what was estimated, but definitely trying to estimate flying some drone imagery 3-6 months out when factors like weather have huge impact on whether or not it can be done is harder than estimate how long it will take some concrete to dry.